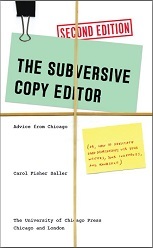 Carol Saller is editor of the Chicago Manual of Style Online’s Q&A and editor of the CMOS Shop Talk blog. In addition to The Subversive Copy Editor, she has written several children’s books, the latest of which is Eddie’s War, a young-adult novel set in rural Illinois during World War II. Carol's conference and retreat sessions are geared toward helping writers give their work a final polish. Read more about Carol at carolsaller.com. Read more about Eddie's War at eddieswar.com.